Setting up trusted domain in SharePoint 2010: An exception occurred in AD claim provider when calling SPClaimProvider.FillSearch(): Requested registry access is not allowed. I was setting up trusted domain for the people picker in SharePoint 2010. I was able to get it to work on one environment but not the other. On the environment that wasn’t working, the steps to set it up were all successful. The people picker however could not resolve any username, including those in the current domain. An exception occurred in AD claim provider when calling SPClaimProvider.FillSearch(): Requested registry access is not allowed.. The first message also appears in the Event Viewer. The messages clearly indicate that something did not have access to read something from the Registry. I downloaded Process Monitor (http://technet.microsoft.com/en-us/sysinternals/bb896645) from MS Sysinternals, which is an incredible tool that allows us to monitor all access to the Registry (among other things). This will quickly show that the problem occurs when the w3wmp.exe process tries to read the Registry key HKEY_LOCAL_MACHINE\SOFTWARE\Microsoft\Shared Tools\Web Server Extensions\14.0\Secure. This is where the apppassword (set by the stsadm command) is stored. Double click the failing entry in Process Monitor and you will see that the user who’s trying to read the Registry above is the app pool account of the SharePoint web app. I added the app pool account to the local Administrators group, reset IIS and everything started to work. I checked the other environment where it was working and indeed the app pool account was added to the local Administrators group. (Probably better to add the app pool account to the WSS_Restricted_WPG_V4 group though). Not sure why the app pool account was not setup properly by default or if I missed a required config step – but anyway it’s working now and I’m happy :). 8 Responses to Setting up trusted domain in SharePoint 2010: An exception occurred in AD claim provider when calling SPClaimProvider.FillSearch(): Requested registry access is not allowed. I just ran into this same scenario on a single-server farm that I’ve built for a developer (I’m a systems guy). Anyway, I wanted to ask… Are you doing something funny with local machine service accounts? Or, when you configured “peoplepicker-searchadforests”, did you set a username and password for the local domain in addition to other ones? No, I did not have to do anything ‘funny’ with the local service accounts (except for what described in this post). I only had to specify the username/password of the account to access the other domain, not of the local service account. nice work, did help me a lot ! Best practice for the solution would be to give read permissions for this key to the local group “WSS_WPG” – this group usually contains all the app pool accounts. Just wanted to say thanks for posting this – that Process Monitor tool is great. This error happened to me, even though my system had been working before. I was getting the registry access denied error, but the event log didn’t tell me which registry was causing the error. 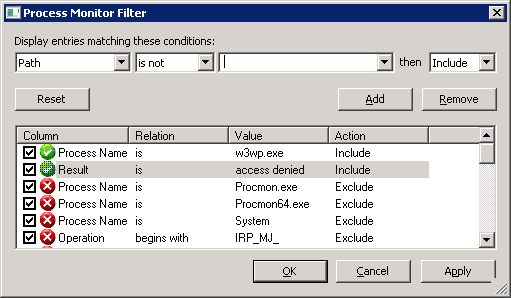 This blog on how to use the process monitor tool to tell you which registry entry was getting access denied was the key to resolving my issue. In fact, it was the same registry key you mentioned in your blog. I even found a bunch of other non-critical registry keys that SharePoint was trying to access, as well. Thanks, again for this posting!